Born at Huntington, West Virginia, February 2, 1908, he earned the Medal of Honor during World War II while serving with the 3rd Assault Battalion Landing Team, 25 Marines, 4th Marine Division, on the Island of Iwo Jima on February 19-25, 1945. His nickname was "Jumping Joe." 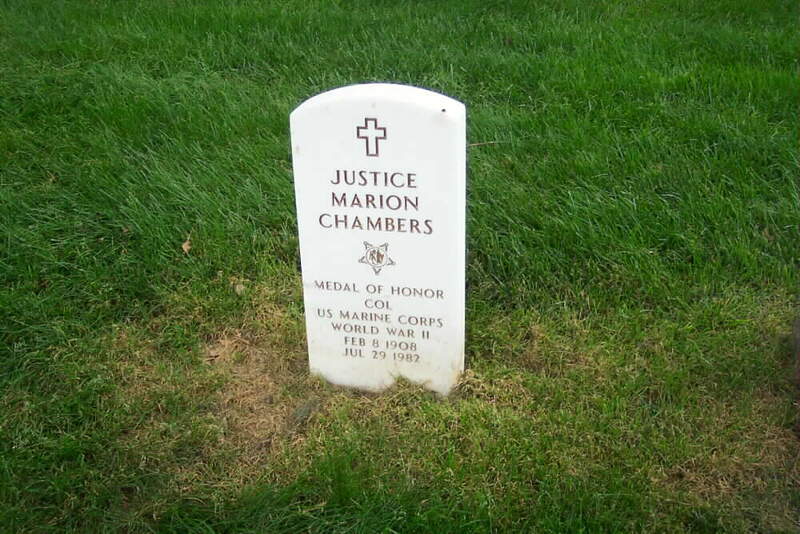 He died on July 29, 1982 and was buried in Section 6 of Arlington National Cemetery. Rank and organization: Colonel. U.S. Marine Corps Reserve, 3rd Assault Battalion Landing Team. 25th Marines, 4th Marine Division. Place and date: On Iwo Jima, Volcano Islands. from 19 to 22 February 1945. Entered service at: Washington, D.C. Born: 2 February 1908, Huntington, West Virginia. For conspicuous gallantry and intrepidity at the risk of his life above and beyond the call of duty as commanding officer of the 3d Assault Battalion Landing Team, 25th Marines, 4th Marine Division, in action against enemy Japanese forces on Iwo Jima, Volcano Islands, from 19 to 22 February 1945. Under a furious barrage of enemy machinegun and small-arms fire from the commanding cliffs on the right, Colonedl Chambers (then Lt. Col.) landed immediately after the initial assault waves of his battalion on D-day to find the momentum of the assault threatened by heavy casualties from withering Japanese artillery, mortar rocket, machinegun, and rifle fire. Exposed to relentless hostile fire, he coolly reorganized his battle-weary men, inspiring them to heroic efforts by his own valor and leading them in an attack on the critical, impregnable high ground from which the enemy was pouring an increasing volume of fire directly onto troops ashore as well as amphibious craft in succeeding waves. Constantly in the front lines encouraging his men to push forward against the enemy's savage resistance, Colonel Chambers led the 8-hour battle to carry the flanking ridge top and reduce the enemy's fields of aimed fire, thus protecting the vital foothold gained. In constant defiance of hostile fire while reconnoitering the entire regimental combat team zone of action, he maintained contact with adjacent units and forwarded vital information to the regimental commander. His zealous fighting spirit undiminished despite terrific casualties and the loss of most of his key officers, he again reorganized his troops for renewed attack against the enemy's main line of resistance and was directing the fire of the rocket platoon when he fell, critically wounded. 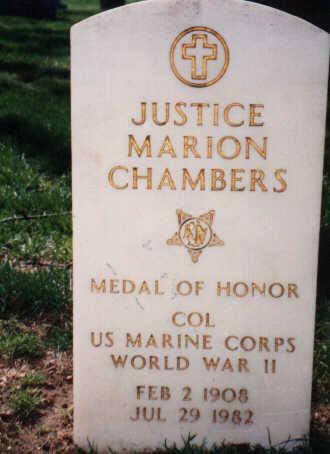 Evacuated under heavy Japanese fire, Colonel Chambers, by forceful leadership, courage, and fortitude in the face of staggering odds, was directly instrumental in insuring the success of subsequent operations of the 5th Amphibious Corps on Iwo Jima, thereby sustaining and enhancing the finest traditions of the U.S. Naval Service. 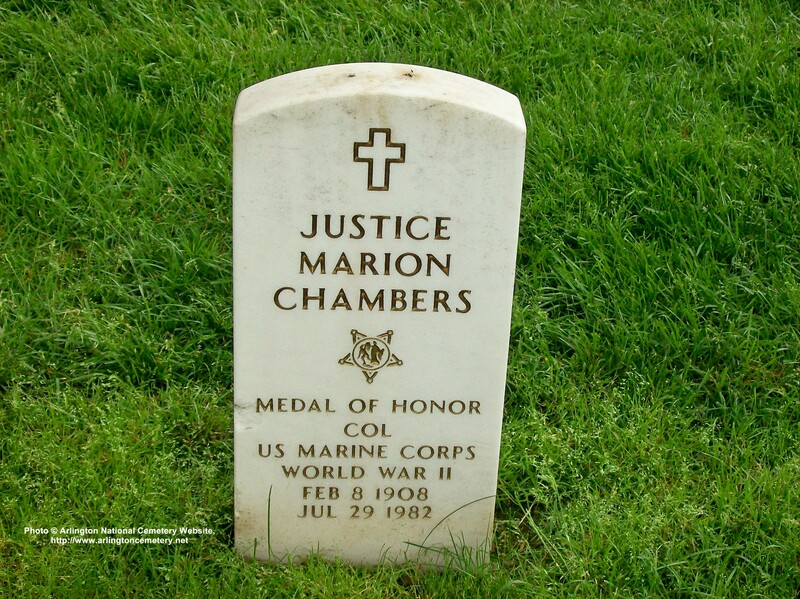 My grandfather's name is Colonel Justice Marion Chambers USMCR. He earned the Medal of Honor for his actions during the battle of Iwo Jima in World War II. He was assigned to the 3rd Battalion, 25th Marines, 4th Marine Division and landed on the far right flank during the invasion. It was only at the end of his life that I finally realized that even outside of the family, he was regarded as a great and brave man. I was only 12 when he died and all that I ever knew about his efforts during the war was learned from books. He was humble about his accomplishments and never talked much about the war years and when the grandchildren were of age he told us that, "You are never to talk about my accomplishments or bring them to the attention of others." I knew that even contacting you would break my promise but, things have changed somewhat. He has a great granddaughter that he will never know and that will never know him except through the same means I found out about him, through books. Now, I would like to see some small remembrance of him left behind so that she will be able to understand. Aside from having a wonderful family that he raised alone after the war years, he came from a small town, Huntington West Virginia. He left to pursue his education in the Washington, D.C. area and joined the Marine Reserves before the war. When the war started he was called to active service and joined Edson's Raiders and landed at Tulagi. He took part in many other invasions during the war and earned several medals and commendations along the way. By the time the war ended he was the only reservist to have command an active or regular Marine Battalion. In the end he was one of the highest ranking Marines to earn The Medal. He was medically discharged due to wounds suffered during the war. 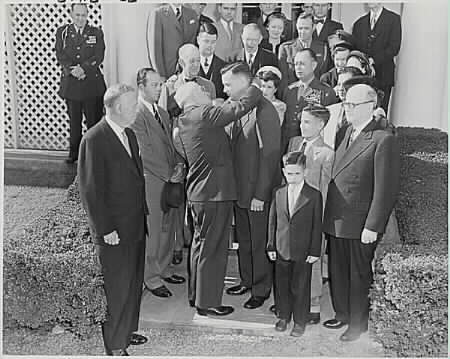 He was awarded the Medal of Honor by President Harry Truman in 1946. 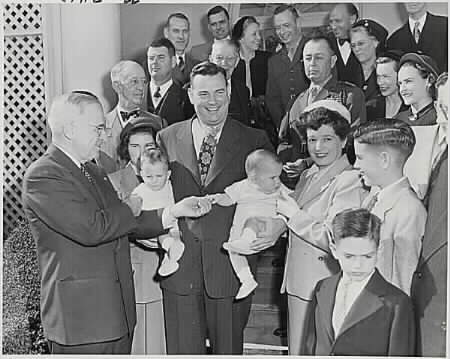 But, like I said Mr. Patterson, I knew him as a loving and doting Grandfather long before I knew of him as a war hero. 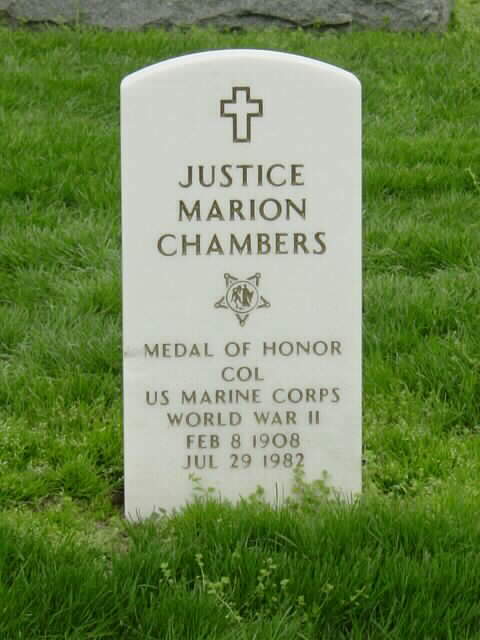 I guess the thing he was happiest and proud of is that, he raised a loving and close family and his son, my father Lieutenant Colonel Justice Marion Chambers Jr. USMC (RET) followed in his footsteps. 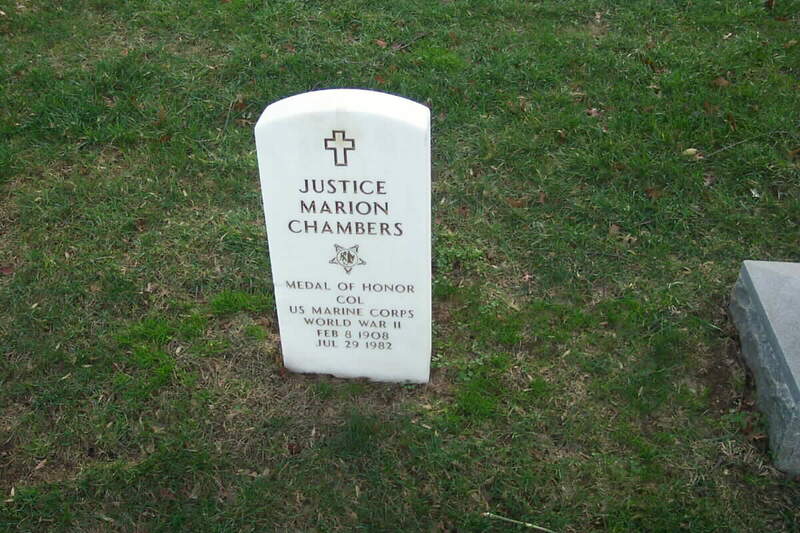 Now, my brother Captain Justice Marion Chambers III, USMC, carries on the tradition.